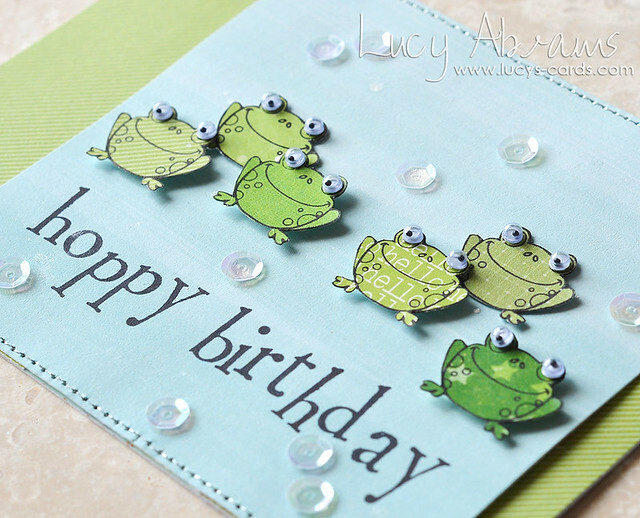 Today I have a fun birthday card for you that I created with a stamp from Simon Says Stamp's brand new Princess stamp set. 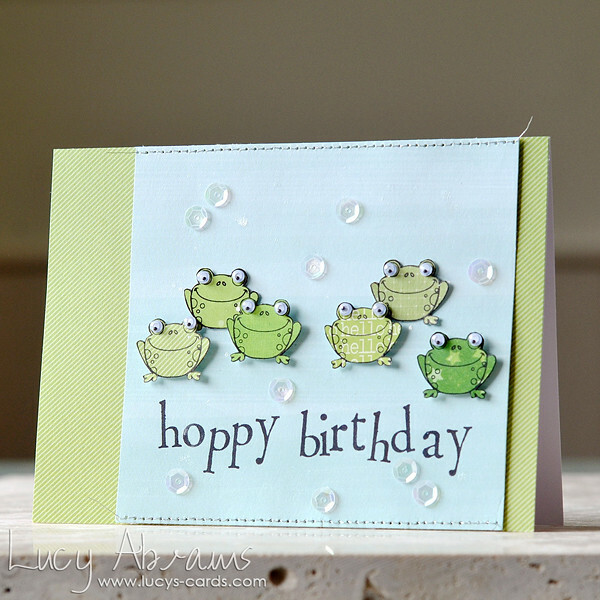 I knew these frogs needed wiggle eyes… and the customised sentiment, created with some Hero Arts alphabet stamps, seemed a good fit. 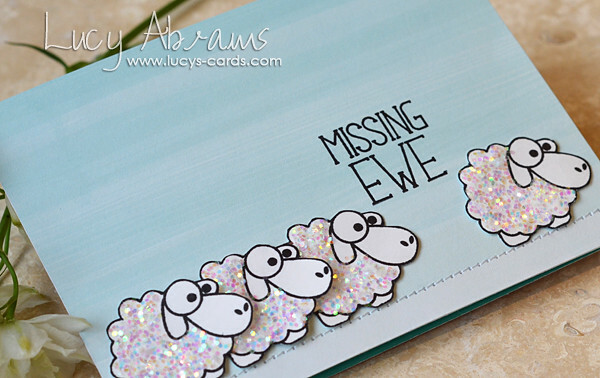 I added some Calico Shine and Doodlebug sequins to my watery background to try and create a bubble effect. OK - that's all I have for you today. Hello. As promised, I have another card to share with some Avery Elle Storybook stamps, but this time I have done some paper piecing with them. 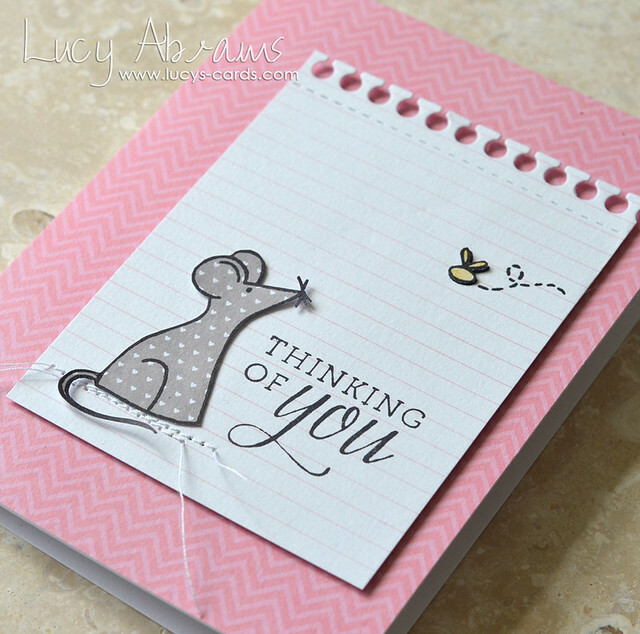 I used patterned papers from Pebbles Special Delivery Girl pad, a 'Thinking of You' sentiment stamp from THIS Hero Arts set, and the Notebook Edge die from Clearly Besotted. Ok - thank you for stopping by, I'll be back very soon! 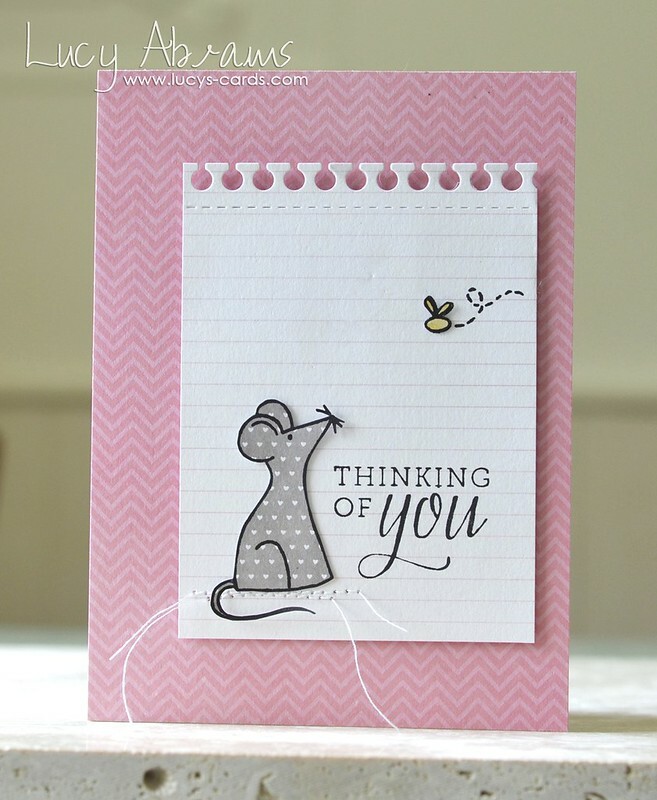 Today I have a 3rd card to share that I created with the July Simon Says Stamp Card Kit. 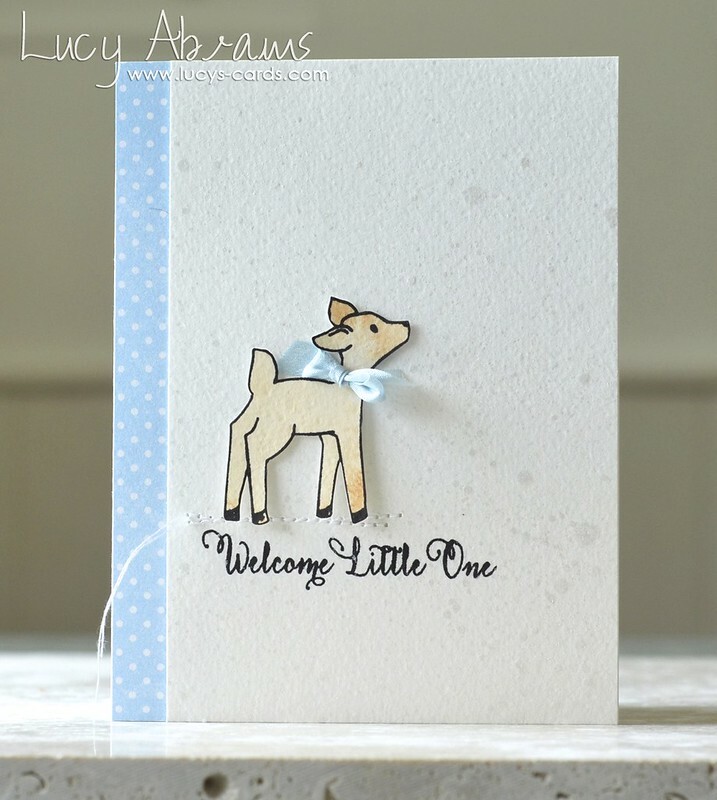 This card is inspired by the style of Jocelyn Olson whose cards I cannot get enough of at the moment (this one in particular I really love. And this one.). The way that Jocelyn layers paper astounds me. I jut adore it. So I thought I'd have a go at some paper layering myself. For my card, I selected three papers from the Pink Paislee pad, layered them up and stitched them together. I added the gorgeous sentiment with a heart, and another tiny sentiment on the side which I hand cut from another piece of paper. I really love the layers look and will definitely be trying this again. Jocelyn, thanks for being such an inspiration. :) You rock. 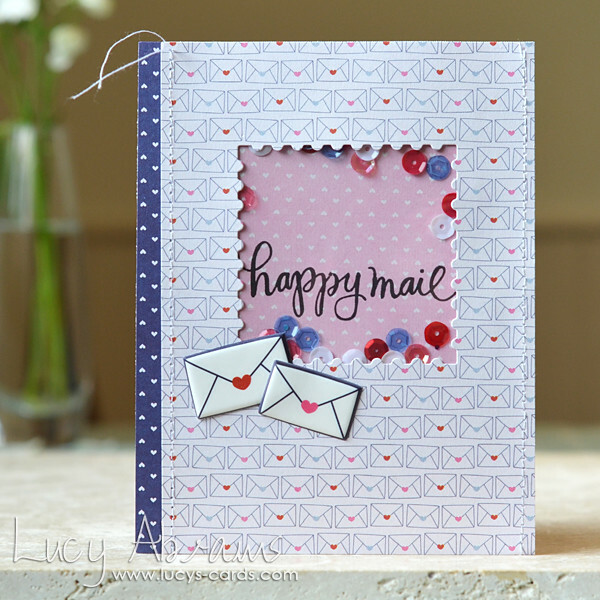 I'm back with a 2nd card created with the July Simon Says Stamp Card Kit. 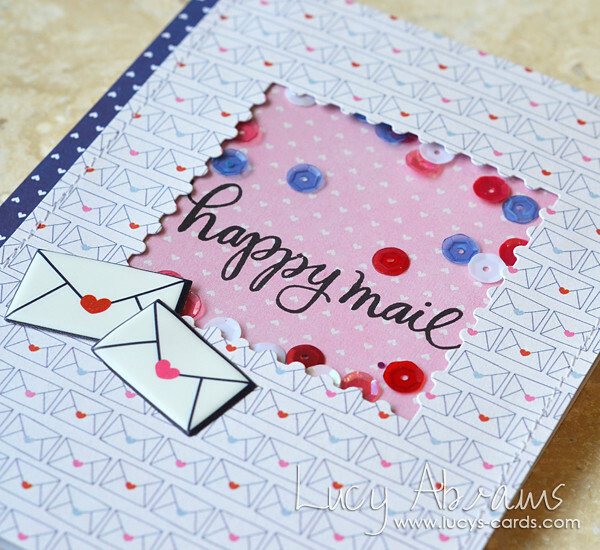 On this card, I used three different papers from the Pink Paislee Pen Pals Paper, two of the cute puffy stickers, one of the stamps, and a sprinkling of delicious Doodlebug sequins… because what screams "happy mail" more than a shaker card?? I die cut the postage stamp with one of THESE SSS dies. Perfect for this card. I just reorganised my video page, and added a page with all my tutorials too. You can see them at the top of my blog, under the header, or click on these links (VIDEOS) (TUTORIALS). Long nursing sessions and a baby who loves to nap on Mama mean plenty of time to Pin, so if you are interested in seeing what inspires me, click HERE to follow me on Pinterest. I recently discovered Craftgawker and have had a few projects published there. If you're not familiar with it, it's an amazing gallery of crafty projects, all with direct links to detailed tutorials. If you've time to spare, I recommend taking a peek. There's a whole ton of inspiration to be had! I just added a load of cards to my online shop!! Back soon - I hope you enjoy your weekend. 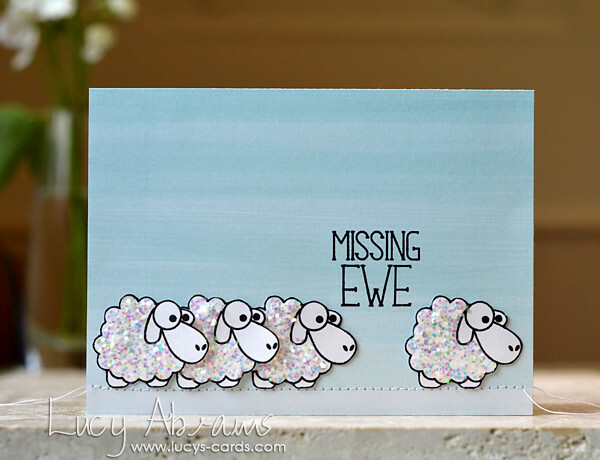 I've been longing to play some more with the wonderful Avery Elle Storybook stamp set, and I finally got my chance! I created a couple of cards and have one to share with you today. I got out my Inktense pencils again, and created this sweet watercolour deer. 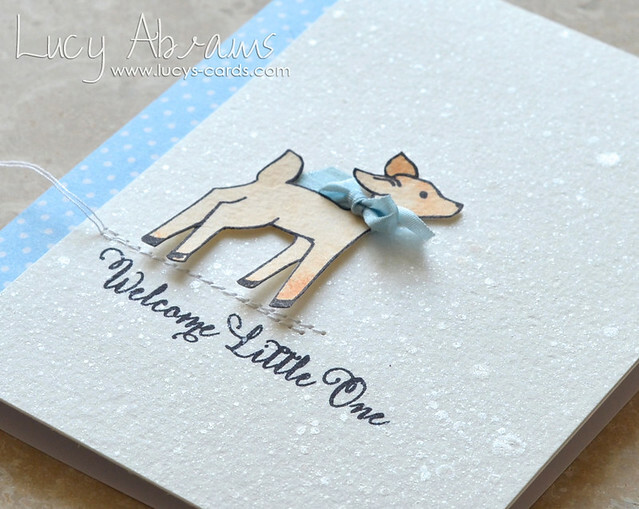 I actually added the brown watercolour to the paper first, then stamped my deer on top. I adhered my deer onto more watercolour paper that I misted heavily with Calico Shine Mister Huey's. The little strip of blue paper is from Pebbles Special Delivery Boy pad. I gave my little boy deer a silk ribbon bow for a bit of extra texture. How much do I love these stamps??? A LOT. They are just TOO CUTE for words. Right - that's all from me today but I have more to share very soon.